I am disgusted. I have reached my wits end with the current administration of the Hanover Municipal Corporation. I watched the heads of this municipality change three times. However, the physical condition of Lucea continues to worsen. The roads remain treacherous to pedestrians and motorists. The huge drain that facilitates the flow of rain water as it makes its way to the sea, also in full view of the Municipal building, is not cleaned on any regular consistent basis. It begs the question as to how property tax revenue is being disseminated and to whom. Property owners receive little benefit from their tax payment dollars. Goats and mange-covered dogs continue to run free. Too often, unleashed animals scamper across the road in the direct path of moving automobiles. This causes motorists to quickly implement evasive maneuvers to avoid possible critical accidents. Within the town, small potholes in the roadways are allowed to grow into craters. Motorists complain, but our cries for a better Lucea fall on the deaf ears of the administration of the Hanover Municipal Corporation. The Corporation allows the physical welfare of pedestrians and motorists to be at risk daily. Case in point, the photograph accompanying this letter. 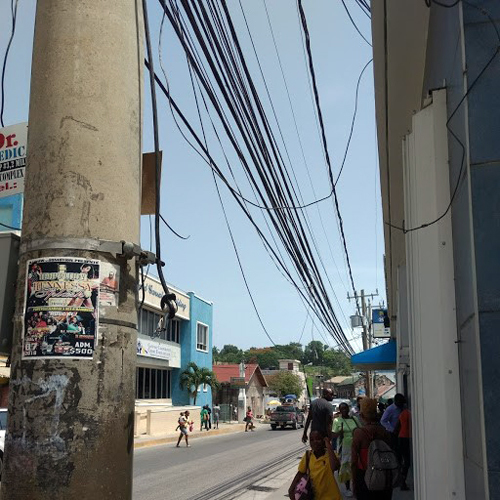 On the main thoroughfare within the town, directly across the street from the credit union, broken electrical and cable wires dangle in the path of the pedestrian walkway. A spaghetti bundle of potentially dangerous live wires looms ready to snuff out the life of unsuspecting passersby. Trash collection is too often ignored. Huge apparently well-fed rodents continue to run rampant in the twilight and evening hours. The rodent population is alarmingly large. Marketers are allowed to sell their produce outside the confines of the market, causing further pedestrian obstructions. Taxi and private bus operators unnecessarily clog the free movement of traffic, as they illegally jockey for position on the main thoroughfare. The bus park, allocated for the orderly loading of passengers, is too often not utilized. Daily, children face the daunting task of negotiating moving automobiles to and from school, due to the absence of proper sidewalks. Another obscure, but nonetheless a major threat to life and property, is the eroding sea-wall. The ocean retaining wall is being undercut by the natural movement of the ocean water. Further erosion would cause the main roadway to collapse and cause devastation to our town. This was brought to light during the tenure of previous administrations. The notice fell on the deaf ears and blind eyes of the Hanover Municipal Corporation. After brief rainfall, the entry point into the town known as “Keep Left”, becomes impassable to foot and automobile traffic. The torrent of rain water runoff, which crosses the path of the roadway, is great. Access in and out of Lucea becomes impassible until the water flow subsides. The historic clock along with the roof in which the Hanover Municipal Corporation is housed, are in dire need of repair. Yet its fixup has been ignored over the tenure of three administrations. I wish to point out also that Lucea is the doorway to many Negril Resort locations. Tourists daily are driven through Lucea to get to their resort points. Lengthy traffic snarls in Lucea hamper them from promptly reaching their vacation destinations. The physical condition of Lucea presents a dilapidated representation of what Jamaica truly is. It is an embarrassment to every Jamaican as the tourists take away inaccurate accounts of what we as a people truly are. I declare a no confidence vote on the current administration of the Hanover Municipal Corporation. I cry out to the National Government to make a meaningful contribution to help Lucea achieve acceptable levels of cleanliness and public order. Lucea is in a state of flux, with under-management and disorder being the order of the day. In other words, TOTAL chaos. On behalf of all Jamaicans who live, visit or drive through Lucea, I cry out for assistance from Andrew Holness, Prime Minister of our country. No one else in lower levels of government management, have been able to or have cared to stem the tide of the further ruin of our historic town. Mr. Holness, should you too ignore our requests for help, it would indicate that no one cares enough to save Lucea from the destructive path that it is currently on. Have you seen Tameka Jones?